Did your kids get any play food for Christmas? My totally awesome sister, Kendra, gave my kids a little shopping cart with lots of play food in it, some of which came in boxes. The kids love them. The only problem with boxes is that they get squished easily...at least if your kids are like mine. Less than 24 hours after they arrived at our house, a few were already looking a bit squished, so this project moved up the priority line. 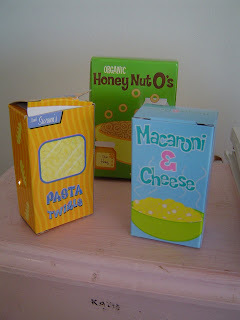 Scrap corrugated cardboard, ruler, scissors or rotary cutter, glue gun, noodles or other filler food are optional. Measure the bottom of your box. You can do this with a ruler or just by put your box on top and make a mark. 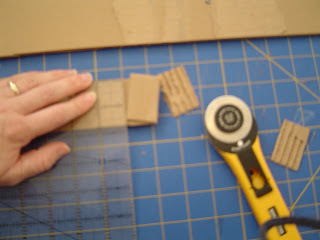 You'll want to cut your pieces, but a little bit smaller than your box to make sure they'll slide down into it easy. 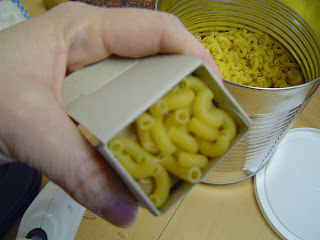 I made mine about an 1/8 inch smaller in each direction than the outside dimensions of the box. I just measured the first one and then used pieces I'd already cut to measure, but kept using my ruler to make the lines straight. You could easily do this with scissors. 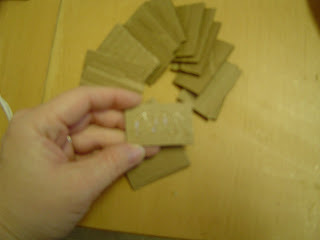 Once you've got a nice pile of cardboard rectangles, pull out your glue gun. 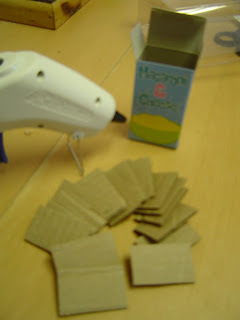 Glue your little rectangles together using a glue gun or other glue. Keep gluing the rectangles together to make a tower. Make sure that the rectangles are lining up straight. If you're not putting anything inside the box to look like food, you'll want to make your cardboard stack as tall as your box. 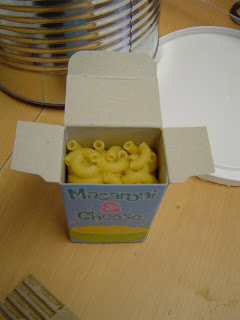 Since these boxes were for noodles, though, I decided to glue some noodles on the top. If you're adding some sort of play food to the top, you'll want to leave some space. 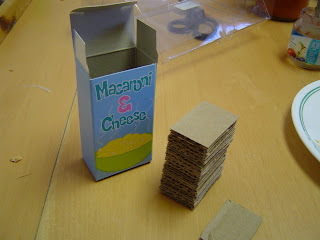 I put my cardboard stack inside and then added big globs of glue from the glue gun and then filled it up with noodles. I made sure not to get the glue on the sides, so if I ever decide to take the filler out, I can. 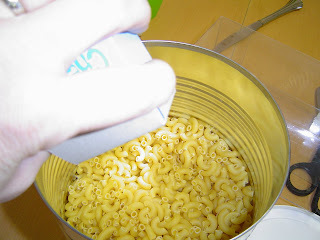 I dumped out any loose noodles and then used the glue gun and more noodles to fill in any empty spaces. And we also made some Pasta Swirls. The final step, which I didn't take picture of, is that I reinforced the box with mailing tape. I like the stuff that comes from Costco because it's really think. (I also use it to protect the spines on our kids books...especially board books.) It's especially important to do something for the top of the box because this is the part the kids are most likey to rip when they got to open the box. It's quick, it's easy...so go do it before your kids ruin their play food. 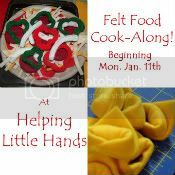 Update: 1/20/2010 If you're interested in other great ideas for kids' play food, come join our Felt-Food Cook-Along. There something for everyone...no-sew, hand-sewing, and/or machine sewing. We're well underway, but there's lots to go. See the link of foods we've done so far at the top of the right sidebar. 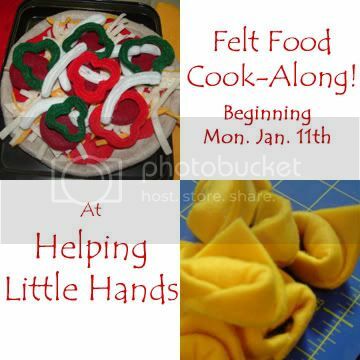 You can also share your felt food creations here. What a great idea. I wish I would have seen this sooner! We have had to throw away a few of the boxes already. Good idea! My 3 yr old definitely got play food from Santa. So so clever! Thank you for posting this amazing idea! I usually try to steer away from this kind of playfood for that very reason - Thanks for the solution!! Happy New Year! very cute and I love the idea of glue the food to the top. Love it! WHAT A GREAT IDEA!....and the noodles on top! GENIOUS! Great idea! I love the noodles! That is a really great idea. And it makes the boxes way more fun! Great idea! 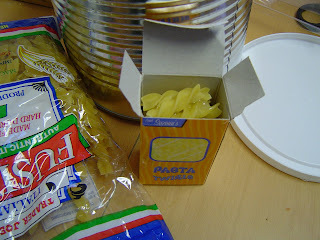 I love, love the pasta idea. Oh my goodness! My daughter got this same cart and groceries set from Target for Christmas, and she loves it. But I follow her around like a nazi while she plays with it to make sure that she doesn't crush the boxes. This makes like so much easier! Thank you!